Just a short and simple post today to mark the completion of two years of blogging. Last year, to celebrate my one year anniversary, I posted a recipe for a rich pistachio cake. Since cake is always a good idea, I am posting another cake recipe to observe the day this year. And not just any cake...another pistachio cake (I do love pistachios...). This year's cake is a Pistachio & Chocolate Tea Bread. In texture, it is very much like a pound cake...fine grained and firm. It slices beautifully into thin slices that are perfect for a late afternoon cup of coffee or tea. But what I really like about this cake is that it is meltingly tender...it seems to dissolve in your mouth. Because of the high percentage of egg, classic pound cakes can be tough. So like most modern pound cakes, this cake contains fewer eggs. Further tenderness comes from the fact that finely ground pistachios replace some of the flour...not to mention the fantastic flavor and color they give. Besides the flavor of pistachio, the cake is enhanced with flecks of bittersweet chocolate and orange zest. I love both chocolate and orange with pistachio...but I'm sure the cake would be pretty fine if either (or both) of these were left out. I made two different glazes to embellish the finished cake—one to pick up the chocolate aspect and another the orange. I fully expected to prefer the cake glazed with chocolate ganache. But I was surprised by how much I liked the one iced with a simple powdered sugar and citrus glaze. The one you choose to use may depend on the time of year...the chocolate one seems more appropriate for cold weather, while the citrus seems light and refreshing for spring. Your choice may also depend on how and when you are going to serve it. If you are making it for a dessert or afternoon consumption, chocolate is the likely choice....while the citrus glaze is better for a morning occasion....like tea...or a brunch. I don't know if I can promise that I will post a pistachio cake every year on my anniversary. But, you never know what the future will bring. It is in fact a bit hard for me to believe that I have been keeping a blog for two years. Yet, here I am, continuing with no end in sight. What started out as a tentative experiment has turned into a constant presence in my life. 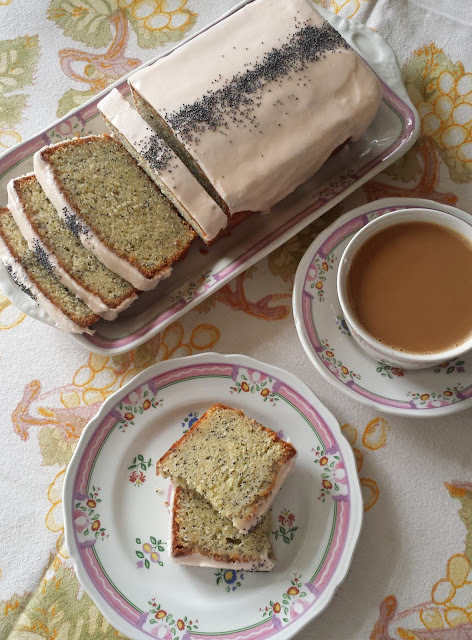 And as far as the annual appearance of a pistachio cake is concerned, my anniversary will always fall on the eve of St. Patrick's day, making a lovely green cake an especially fitting tribute to the season. Preheat the oven to 350°F. Butter and flour 2 8-cup loaf pans. Combine the dry ingredients and set aside. Cream the butter and sugar until light and fluffy (about 5 minutes). Beat in the zest if using along with the vanilla. Beat in the eggs, one at a time. Fold in the dry ingredients in three additions, alternating with the sour cream in two additions, beginning and ending with the dry ingredients. Turn the batter into the prepared pan(s). Bake until golden and a cake tester comes out clean—about 50 minutes to an hour. When the cakes are done, cool in the pans for 10 minutes; invert the cakes onto a wire rack and cool completely. Glaze with Chocolate Ganache or Citrus Glaze (below). • To toast the pistachios, spread on a baking sheet and place in a 350° oven. Bake, stirring once or twice, until fragrant and tinged with gold—about 5 minutes. • I have not tried it, but I imagine that a 3/4 sized batch would be perfect for a 12-cup bundt pan. Place chocolate in a large bowl. Bring heavy cream to a simmer. Immediately pour cream over chocolate. Stir once to distribute cream and let sit for a minute or so to allow the heat to penetrate the chocolate. Whisk until chocolate is melted and ganache is smooth. Use right away, or allow to cool briefly before pouring over the cakes. Use an offset spatula if necessary to smooth the top. The glaze should drip down the sides of the cakes. Combine all of the ingredients in a bowl and beat until smooth. Taste and correct the balance of flavor with lemon juice. The glaze should be thick....if too thin add more powdered sugar...if too thick add more orange or lemon juice. Pour half of the glaze over each cake and use an offset spatula to smooth the top and force the glaze to the edges where it should drip slowly and randomly down the sides of the cake. LOVE Your Anniversary! Happy day to you and keep the education and full stomaches coming! Pistachio cake sounds like a nice tradition on the eve of St. Patty's Day. Your cake sounds delightful with orange zest and chocolate...two flavors that I love together. Congratulations on 2 years! Two years flies by for sure! My baby is 5 today! Lots of cake going on here! Can't wait to see more from your blog and make more of your recipes to come! Happy Anniversary to the best food blogger out there! Your artistry, flavors and attention to detail still amaze me! Many thanks for making our table a better place! The best to you as you strive on! Happy anniversary to you! I always enjoy reading your posts, and have made some of your recipes. Without fail, everything is delicious. Thank you (and everyone else who commented too!) for your congratulations and feedback. I love hearing when people have made something I posted with good success! As far as using both glazes is concerned...I don't know. But I am always in favor of experimenting. Drizzling with both might be nice. If I were to enrobe with one and drizzle with the other, I think I would choose to enrobe with the citrus. This is possibly because I really liked the cake with the citrus glaze. But I also think it would look better. The citrus glaze is a bit translucent and might not look right on the dark chocolate. If it is a stronger citrus flavor you are after, you could make a citrus syrup: In a small saucepan combine the juice of an orange, a tablespoon or so of lemon juice and a quantity of sugar equal to the combined weight of the juices. Bring to a simmer and simmer until the sugar is dissolved. Brush the warm cakes with the warm syrup. When cool, glaze with the ganache.